The current Los Angeles Metro Rail system map of six train lines, with two Metro Liner bus rapid transit lines. In Los Angeles County, California, the Metro Rail system is a combined rapid transit and light rail system, operated by the Los Angeles County Metropolitan Transportation Authority (LACMTA or Metro). The system is composed of two rapid transit lines and four light rail lines, covering 105 miles (169 km) of route service. In 2017, the Metro Rail system served an average 359,016 passengers each weekday, totaling 706.7 million passengers in the calendar year. Metro Rail is one of the largest rapid transit and light rail systems in the United States by ridership. The system is complemented by Metro's two Metro Liner bus rapid transit lines. Metro Rail began service on July 14, 1990, when the light rail Blue Line opened between Pico and Anaheim stations; the line was extended to Downtown Long Beach and Pacific Avenue stations on September 1. The Blue Line was extended one stop northward from Pico to 7th Street/Metro Center on February 15, 1991. The next Metro Rail line, the rapid transit Red Line, opened on January 30, 1993, between Union Station and Westlake/MacArthur Park station. The light rail Green Line, the system's third line, opened on August 12, 1995 from Norwalk to Redondo Beach stations. Metro Rail's next expansion occurred on May 22, 1996, when the Red Line expanded westward from Westlake/Macarthur Park to Wilshire/Western stations. The Red Line expanded again on June 12, 1999, with a branch from Wilshire/Vermont to Hollywood/Vine stations. 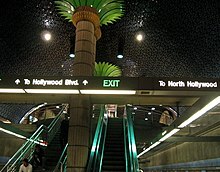 The final section of the Red Line opened on June 24, 2000, from Hollywood/Vine station to North Hollywood station, completing the Red Line as originally planned. A fourth Metro Rail line, the light rail Gold Line, opened on July 27, 2003 between Union Station and Sierra Madre Villa station in Pasadena. The rapid transit Purple Line became the fifth Metro Rail line on August 24, 2006, when LACMTA separated the Red Line into two separate services; the branch between Union Station and Wilshire/Western station became the Purple Line while the branch between Union Station and North Hollywood station remained the Red Line. The Gold Line was later extended to Atlantic station in East Los Angeles on November 15, 2009. The light rail Expo Line opened between 7th Street/Metro Center and La Cienega/Jefferson on April 28, 2012; two additional stations opened on June 20, 2012. The Gold Line's second extension opened on March 5, 2016 and added six more stations from Sierra Madre Villa from to APU/Citrus College. An extension to the Expo Line on May 20, 2016 added seven stations. The system has 93 stations serving its six lines. Five of these stations are transfer stations, which allow passengers to transfer between lines. Ten of these stations are termini—stations at the end of lines. Forty-nine of the stations are within the city of Los Angeles and the other 44 stations are located in surrounding communities. Platform at LATTC/Ortho Institute station. Blue Line platform at the 7th Street/Metro Center station. Blue Line platform at the Willowbrook/Rosa Parks station (formerly Imperial/Wilmington station). ^ Union Station began operating as a Metro Rail station on January 30, 1993, but it had been continuously operating as an inter-city and commuter rail station since May 5, 1939. ^ a b c "Facts at a Glance". Los Angeles Metro. November 18, 2017. Retrieved May 23, 2018. ^ a b "Metro Interactive Estimated Ridership Stats: Rail, Annual 2017". LACMTA. Retrieved May 23, 2018. ^ "Transit Ridership Report, First Quarter 2011" (PDF). American Public Transportation Association. 2011-05-31. Archived from the original (PDF) on 2011-07-09. Retrieved 2011-09-18. ^ West, Karen (1990-07-15). "Festive Air Marks Debut of Blue Line". Los Angeles Daily News. ^ McGreevy, Patrick (1991-02-15). "Metro Rail's First Subway Station Opens". Los Angeles Daily News. ^ Katches, Mark (1993-01-31). "Red Line Rolls to Raves – It's Smooth Railing As L.A. Subway Opens". Los Angeles Daily News. ^ Mariani-Belding, Jeanne (1995-08-13). "All Aboard! Metro Green Line Makes 1st Run – Thousands Try Norwalk-to-Redondo Beach Train". Los Angeles Daily News. ^ Bloom, David (1996-05-22). "MTA Unveils New Downtown Line". Los Angeles Daily News. ^ Hiestand, Jesse (1999-06-13). "Hollywood Subway Picks Up Rave Reviews". Los Angeles Daily News. ^ Sheppard, Harrison (2000-06-18). "End of the Line". Los Angeles Daily News. ^ Bender, Mary (2003-07-27). "Golden Opportunity - Riders Board L.A.-Pasadena Line". Los Angeles Daily News. ^ "Color Designations" (PDF). LACMTA. 2006-08-24. Retrieved 2011-09-18. ^ Bloomekatz, Ari B. and Hector Becerra (2009-11-16). "After decades of waiting, their trains have arrived". Los Angeles Times. Retrieved 2011-09-18. ^ Turner, Dan (2012-03-23). "Expo Line to fill an L.A. gap". Los Angeles Times. Retrieved 2012-04-23. ^ Nelson, Laura J. (2016-03-05). "San Gabriel commuters cheer as Gold Line rail extension officially opens". Los Angeles Times. Retrieved 2016-03-05. ^ a b c d e f g h Nelson, Laura J. (2016-02-25). "Metro Expo Line to begin service to Santa Monica on May 20". Los Angeles Times. Retrieved 2016-05-20. ^ Go Metro Map (PDF) (Map). LACMTA. 2016-03-05. Retrieved 2016-03-05. ^ "The Guide to the Metro Expo Line: Downtown L.A. to Santa Monica". Discover Los Angeles. Retrieved 2017-11-16. ^ Epstein, Joel (2016-04-12). "How the Expo Line Got to Santa Monica". Huffington Post. Retrieved 2017-11-16. ^ "Regional Connector Transit Corridor Project Contract No. E0119 – Operations and Maintenance Plan (Final)" (PDF). 2.1 Metro Light Rail Overview. Los Angeles County Metropolitan Transit Authority. September 10, 2013. pp. 2–1. Retrieved May 23, 2018. ^ a b "Mapping L.A.: Neighborhoods". Los Angeles Times. Retrieved 2015-12-10. ^ "Metro Rail Timeline". LACMTA. Retrieved 2015-12-10. ^ a b c d e f g h i j k l m n o p q r s t u v "Blue Line: Map and Station Locations". LACMTA. Retrieved 2015-12-10. ^ a b c d e f g h i j k l m n "Red Line: Map and Station Locations". LACMTA. Retrieved 2015-12-10. ^ a b c d e f g h "Purple Line: Map and Station Locations". LACMTA. Retrieved 2015-12-10. ^ a b c d e f g h i j k l "Expo Line: Map and Station Locations". LACMTA. Archived from the original on 2015-12-23. Retrieved 2015-12-10. ^ a b c d e f g h i j k l m n o p q r s t u "Gold Line: Map and Station Locations". LACMTA. Retrieved 2015-12-10. ^ a b c d e f "Gold Line Foothill Extension". LACMTA. Retrieved 2015-12-13. ^ a b c d e f g h i j k l m n "Green Line: Map and Station Locations". LACMTA. Retrieved 2015-12-10. ^ Harnisch, Larry (2009-05-05). "Union Station Opens, May 5, 1939". Los Angeles Times. Retrieved 2011-09-18. ^ "Airport Metro Connector 96th Street Transit Station". LACMTA. Retrieved 2016-12-06. ^ a b c d e f g "Crenshaw/LAX Transit Project". LACMTA. Retrieved 2015-12-13. ^ a b c d e f g "Purple Line Extension". LACMTA. Retrieved 2017-11-13. ^ a b c d e f "Gold Line Foothill Extension". LACMTA. Retrieved 2018-02-10. ^ a b c "Regional Connector Transit Project". LACMTA. Retrieved 2015-12-12. Wikimedia Commons has media related to Stations of the Los Angeles County Metro Rail. This page was last edited on 30 March 2019, at 23:22 (UTC).